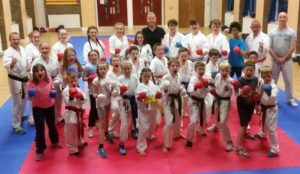 Mizukara is a group of Bangor/Newtownards Karate clubs offering quality martial & fitness training to all ages (from age 5). Our Bangor/Newtownards Karate clubs were founded by Sensei David Brashaw in 1994. Along with Senseis Kevin & Sam Lewis they transformed the initial club into a quality organisation. The clubs offer both traditional & sport karate training. Our coaches are fully insured and have Access NI enhanced approval. Having 25 years developing martial arts students, means our clubs are a fantastic place to start training. Subsequently building up students’ confidence, fitness and martial arts abilities. First of all Mizukara is an inclusive martial arts organisation and welcomes students from all walks of life. We work in conjunction with other karate clubs in Ireland, north and south, and across the UK. This maximises opportunities for our students. In particular we work closely with Sensei Ian Cuthbert, of Karate Sport England. Mizukara training is also regarded as a great way for adults to keep healthy. It also allows them time to set and achieve their own personal goals. Students on the Duke of Edinburgh award scheme often join our clubs. As a result many end up staying with us for many years. Our classes for ‘adults only’ offer speed and core fitness training. With the Shaolin stretching cool-down, they are even more beneficial for adults particularly over thirty years of age. In addition we also offer Tai Chi on request. Check out our ‘Mizukara Fit’ page for more information. The clubs are led by instructors David Brashaw, Levi Kane, Craig Brashaw, Rachael Fleming & Dean Miller. Each is very experienced and recognised internationally has achieved many competition successes. They also deliver modern coaching and deliver innovative training ideas. Our philosophy is firstly safety, next enjoyment and finally achievement. Most of all our beliefs of mutual respect, fairness & achieving together, are the backbone to Mizukara’s ongoing successes. Furthermore it was fantastic to hear comments from Katherine Grainger, Olympic rowing gold medalist. She revealed that her grounding in karate when she was younger, had a profound influence on the massive success she has had in her rowing career. Now, finally after many, many years, it has been agreed by the IOC that karate will be included as an Olympic Sport in 2020. It is FREE to try an initial class in our Bangor/Newtownards Karate clubs. Details are on our Training Times Page and more information can be found on our Contact page.